CSA Utah is a project of the Great Salt Lake RC&D Council that provides a one-stop resource for those interested in CSA in Utah. Both consumers looking for fresh, local food and farmers looking to diversify their operation and make a positive impact in their community will find something here. 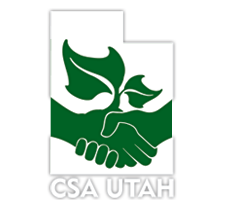 CSAUtah.org is your door to Community Supported Agriculture in Utah. Many farms offer produce shares, where buyers typically receive a weekly delivery of produce, flowers, fruits, eggs, milk, meats, or various other locally produced items. Cost, quantity, length of season, varieties, delivery options vary depending the farmer. Community Supported Agriculture (CSA) is a way for the food buying public to have an active dialogue with a farmer, learn about how they grow their produce, where it is grown and other aspects of their farm. Members invest in farms in their community by paying a lump sum (usually before the growing season) and receive a portion of whatever is in season in their local ecosystem, typically on a weekly basis. In this way ordinary citizens can vote with their wallet by directly supporting farming into their community, inviting sustainable farming into their neighborhood and become an integral part of their world. By making a financial commitment to a farm, people become "members" (shareholders) of the CSA. Some CSAs also provide opportunities for members to experience their farm directly through field events, potlucks, a pumpkin patch or other activities. 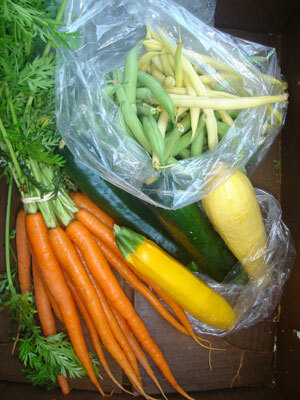 Some may offer members to earn a share by working for the CSA. In Utah, the growing season usually lasts 16 to 20 weeks, from late June through October. Thanks for visiting our site. We hope you come back real often! And remember to browse our list of CSAs! Download our CSA informational brochure.